SPECS : Full Colour. Soft Cover. Matt lamination. A fabulous new baking book available in English and Afrikaans. 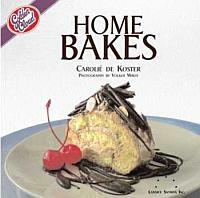 The author is Caroliй de Koster, a talented cookery writer who has a cookery school and guesthouse in Johannesburg. All baking bases are deliciously covered. The recipes, all photographed, are delicious and easy to make, meeting the needs of both the novice and experienced baker. Remember when homes smelled of home-bakes and filter coffee? When having friends and family round for tea and conversation was a regular event? When we had time to cook, time to talk and time to pamper loved ones? All around the world the virtues of ‘cocooning’, ‘comfort food’ and ‘nesting’ are being extolled. There’s a move back to home-cooking, homely recipes and sharing a meal round the dining room table. But ‘back’ really means ‘forward’, for reclaiming the family spirit leads to a whole new world of understanding, communication and calm. Baking is for all seasons. Summer picnics, alfresco spring feasts, and autumnal evenings all inspire different menus, and different cakes, tarts or breads. When the chill of winter keeps us indoors, snuggle up, light the fire (or find a sunny spot on the stoep), and bring back the time when life trundled along at a less frenetic pace. Home baking immediately conjures up images of breads, fresh from the oven, home-made sausage rolls and toasty warm muffins, and baking – with your own two hands – a classic cake. Home Bakes includes them all, some with creative new twists, and many new recipe ideas to broaden your baking repertoire. Home Bakes will teach you what it takes to make baking easy and successful – and most of all, fun. An information section covers basic baking utensils – what they are and their functions, offers general tips that relate to many of the recipes in the book, and clarifies certain baking terms and techniques. This title heralds the return of well-known photographer Volker Miros to the realm of food photography. For the first time in South Africa, he has worked on a full digital photographic system. Assisting him to capture 154 fabulous images in the book is stylist Tamsin Snyman, Lannice’s daughter.